I have constructed a chemplugin model where 2 streams flow into a reservoir (with volume 2000000 m3) and the outflow of the reservoir is the sum of the inflows. Everything seems to work fine except the reported pore volumes replaced (PV) which reports 0. See Por Vol below. The salt balance looks fine (after about 1 residence time the TDS in the dam is just above 50% of that of the streams), so I am wondering if PV is maybe just reporting incorrectly? Is PV only applicable to the initial reaction within a specific instance without consideration of the flow between the instances? I apologize, the pore volume report command in ChemPlugin is actually a stub of a planned future feature. It was not meant to be documented in the User's Guide. It will be available in the next release for sure. We will look into making it available in the current release as well. Once again, I apologize for the inconvenience. No problem. On that note, what is the purpose of "flush" in chemplugin? When there is inflow and outflow at an instance, isnt the solution anyway replaced with the inflowing solution in a chemplugin instance? I am also not sure how chemplugin handles kinetic minerals when the run is extended. When I extend the model, it seems like it is using the original kinetic mineral mass and not the endpoint mineral mass of the previous run. However, extend in chemplugin does use the endpoint solution chemistry and retain secondary minerals. I have tried to use the "pickup reactants" before the ExtendRun or within the original configuration but that doesnt work. I have also tried to remove the kinetic minerals and then let it perform the pickup. But that also doesnt work. To test this I have included pyrite and calcite in the reservoir described above and then calcite was consumed in the 1st run. ExtendRun then starts again with the original calcite (and pyrite)content. However, it seems that secondary minerals in the system (like hematite) is retained. See the gtplot image below. React has a few special mass-transfer configurations, such as the flush, flash, and flow-through models, which are included in ChemPlugin for completeness. They might be useful in a ChemPlugin client designed to emulate React, or to behave similarly to it. One example is the mReact program described in the ChemPlugin User's Guide. In constructing a reactive transport model using ChemPlugin instances, however, these configurations would most likely not be useful. As you've observed, you explicitly specify flow rates into or out of ChemPlugin instances. We're looking into the ExtendRun() member function. Can you confirm that's what you were originally trying to use? And that you attempted to use pickup after your results looked incorrect to you? Thank you Brian. After every run I update the flowrates between the instances and use Extendrun to start the new run. This is the only way I could see one can update the flowrates? I would like the new run to continue the model and not to change the composition of the previous run at endpoint. However, each run automatically starts with the original kinetic mineral content. 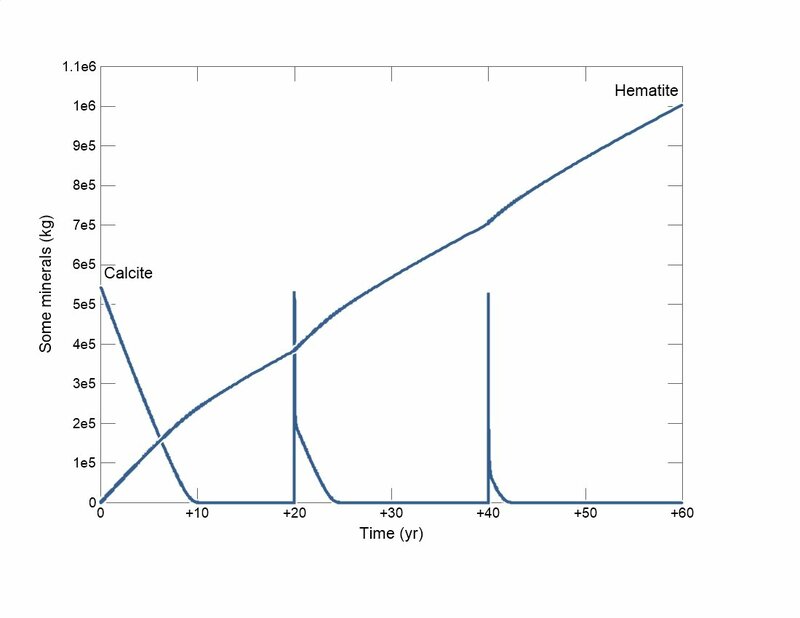 As you can see in the figure above there is every 20 years an Extendrun() and with each run the calcite is at its original concentration. I suspect the pickup function works similiar to the other react functions in that it is not applicable to the chemplugin reactive transport model? I have tried to use all versions of pickpup (incl pickup system = entire) is it has no effect on the chemplugin transport model. I also see that commands like "add" and "remove" works for a mineral but not for kinetic minerals with ExtendRun(). In X1t the kinetic minerals at the endpoint of the previous run is retained when the run is extended but I couldnt see that it is the case in Chemplugin? I was just getting ready to get back to you. The ExtendRun() member function is intended to continue a simulation after a time marching loop ends so that you can chain together additional paths and have everything within a single plot file. The system chemistry is retained from the end of the previous loop, as are the masses of any equilibrium minerals, but all reactants are kept at their original values by default. A fixed CO2 buffer, for example, will be maintained. Similarly, the amount to be added of a simple reactant or kinetic mineral reactant is reset to its original value. The feature is different from extending a completed run in X1t or X2t, as described in 2.22 Running a model in the Reactive Transport Modeling Guide. In that case you’re simply continuing the run without making any adjustments except for the end time. Here, you’re allowed to make adjustments to any reactants before you trigger the ExtendRun() member function. I understand the confusion, and will discuss with the development team whether we want to make any adjustments to the documentation, or less likely, how the member function actually works. I hope you enjoy using the software. By the way, it sounds like you're using ExtendRun() to daisy-chain a series of steady runs (each with a different flow rate) to simulate transient flow. You can, however, set up transient flow without the ExtendRun() function. For steady flow, call the “FlowRate()” member function once, before entering the time marching loop. For transient flow, alternatively, call “FlowRate()” at the head of each pass through the loop.